At Instant Imprints Morrisville, NC, our customers come to us when they want to be more visible to their customers. We create that visibility five different ways: Branded Apparel (embroidery), Signs & Banners, Promotional Products, Custom T-Shirts and Print Services. Absolutely loved my experience at Instant Imprints! Wonderful staff and very professional in every way! I will definitely use Instant Imprints for all of our business needs moving forward! Thank you!!! Are you looking to promote an upcoming event, sports team or business with custom t-shirts, printing services, promotional products, custom banners or branded embroidery items? Then look no further than Instant Imprints in Morrisville! We have your entire promotional needs covered, whether you’re looking to make a local impact or be seen around the globe. Your brand visibility can reach new heights with the promotional power that Instant Imprints in Morrisville can provide! At Instant Imprints, we’re proud to serve businesses and individuals in Morrisville looking for their projects to stand out. When you need the skills of a nationwide industry leader combined with the local touch that only a local Morrisville Image Expert can provide, look no further than our showroom location on Airport Blvd. Next time you’re driving through town, just ask your smart speaker, “What’s the best print shop near me?” and you’ll be sure to find Instant Imprints! Every brand knows the power of custom t-shirts to turn heads and make an impact on the population. That’s why virtually every major logo design can be found on a custom tee, bridging the gap between advertisement and fashion. Those who wear your shirts, whether they be customers or employees, serve as walking billboards that promote your brand wherever they go. When you want your logo to travel the globe, there’s no better way than with a custom tee! 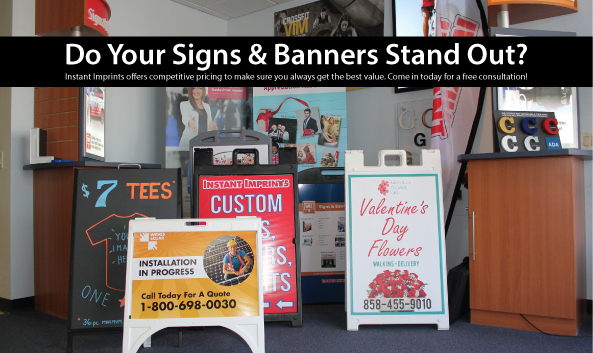 Custom signs and banners help you rise above the competition, whether you use them to grab the attention of people on the highways or the sidewalks. At Instant Imprints, we have a wide variety of customization options so you can stand out in your own unique way. Across Morrisville and beyond, you can promote a new product or an upcoming event with a clarity and style that is sure to turn heads. Whether you’re looking to print a postcard or a massive banner, Instant Imprints in Morrisville is your one-stop promotional product solution! When you’re ready to take your brand visibility to the next level, come by our Morrisville Showroom and speak to one of our local Image Experts. We’ll be happy to help you design and create the perfect promotional product, all under one roof. Stop in today, give us a call at (919) 468-9808 or request a quote online to get started!